Alongside looking attractive, digital signage is a simple and effective way to educate, inform and entertain your target audience. Communicating to a mass audience may seem like a great idea, but reaching your target audience for your specific needs is much more important. One of the main benefits of digital signage is the ability to reach the right audience at the right time and with the right message. If you aren’t fulfilling this, is there really any need for digital signage? Two types of digital signage systems you can compare and contrast include cloud-based and on-premise. Here at Dynamax, we offer both types of software (digitalsignage.NET and POVng) depending on which one is the most suitable for your needs. The two signage systems work differently and it’s extremely important to research in detail what is best for you before going ahead and making a purchase. Here is an infographic we produced earlier to explain both cloud-based and on-premise in depth. The location of your screens will effect the amount of people who notice your digital signage, meaning your ROI is essentially dependent on it. If you want to make the most out of your digital signage network, placing your digital screens where your target audience will see is essential. For a visitor, a reception is a place where they will have time to look at a screen and digest the information. However, placing a screen in a staff room that is aimed at visitors would be a waste, so be sure to consider your location/s before deploying your digital signage network. 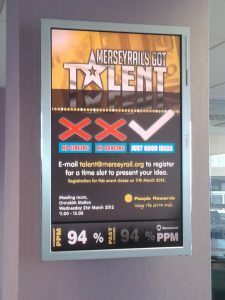 There’s many other aspects of digital signage to consider before going ahead and deploying it. 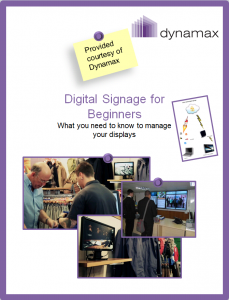 If you’d like more advice and information, you can click on the picture below to download our white paper “Digital Signage for Beginners” – for FREE. Or you can contact our experts today to have a chat about a digital signage solution we can create, specifically for you. This entry was posted in Tips and advice by Dynamax. Bookmark the permalink.